The population structure and seasonal movements of alpine birds in Europe are still largely unknown. Species living in high mountains now face acute risks of habitat loss, range contractions and local extinction due to current and projected climate change. Therefore, a better understanding of the spatial structuring and exchange among populations of European mountain birds is important from both ecological and conservation points of view. The White-winged Snowfinch Montifringilla nivalis is one of the most characteristic passerines of alpine habitats in Europe. Despite the fact that its breeding nuclei are relatively well defined, we still know little about the species’ population structure and movements in Western Europe. By analysing two mitochondrial loci (cytochrome b and the control region) and stable isotopes of hydrogen (δ2H), we assessed to what extent breeding populations of White-winged Snowfinches in the Cantabrian Mountains (CM), the Pyrenees and the Alps, and also a wintering population in the Eastern Pyrenees, function as a metapopulation. We first show the phylogenetic relationships of the White-winged Snowfinch (Montifringilla nivalis subsp. nivalis) within the Snowfinch complex. When assessing the population structure in Western Europe, most mitochondrial haplotypes were present in all breeding populations, but one was only found in the CM where it predominated. The most widespread haplotypes at the breeding grounds were found in the majority of the wintering individuals, but none of them showed the haplotype specific to the CM. We did not find differences in δ2H for the primary feathers among breeding populations, but rectrices of individuals wintering in the Pyrenees had considerably lower δ2H values: isotopic analysis could thus be useful to assign wintering birds to their Alpine breeding grounds. 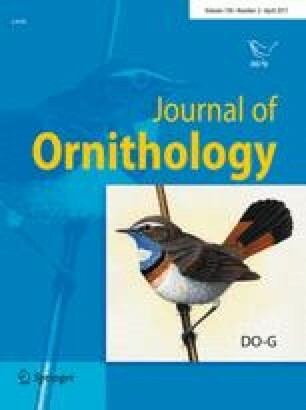 Further studies combining ringing and the analyses of intrinsic markers are an essential step in better appraising the species’ metapopulation dynamics and guiding conservation. Die Populationsstruktur des Schneesperlings Montifringilla nivalis in Westeuropa auf Grundlage von genetischen und IsotopenanalysenDie Populationsstrukturen und saisonalen Wanderungen alpiner Vögel in Europa sind noch immer weitgehend unbekannt. Hochalpine Arten sehen sich akuten Risiken von Habitatverlust, Lebensraumschwund und lokaler Extinktion durch den gegenwärtigen und erwarteten Klimawandel gegenüber. Deswegen ist ein besseres Verständnis der räumlichen Struktur und des Austauschs zwischen Populationen europäischer alpiner Vögel sowohl unter ökologischen als auch naturschützerischen Gesichtspunkten wichtig. Der Schneesperling oder Schneefink Montifringilla nivalis ist ein Charaktervogel alpiner Habitate in Europa. Obwohl seine Brutvorkommen relativ gut bekannt sind, wissen wir wenig über die Populationsstruktur und Wanderungen der Art in Westeuropa. In dieser Arbeit untersuchten wir mittels zweier mitochondrialer Loci (Cytochrom B und Kontrollregion) und Wasserstoffisotopen (δ2H) inwiefern Brutpopulationen in den Pyrenäen, Alpen, Kantabrischen Gebirge, und eine Winterpopulation in den östlichen Pyrenäen als Metapopulation fungieren. Wir charakterisierten zuerst die phylogenetischen Beziehungen der Unterart nivalis innerhalb des Artenkomplexes. Bei der Untersuchung der Populationsstruktur in Westeuropa wurden die meisten mitochondrialen Haplotypen in allen Brutpopulationen nachgewiesen. Lediglich im Kantabrischen Gebirge dominierte ein privater Haplotyp. Dieser wurde auch nicht in den überwinternden Vögeln gefunden, bei denen die sonst am weitesten verbreiteten Haplotypen überwiegten. Wir fanden keine Unterschiede im δ2H von Handschwingen zwischen den Brutgebieten, allerdings hatten in den Pyrenäen überwinternde Individuen deutlich niedrigere δ2H Werte in den Schwanzfedern. Dies deutet darauf hin, dass Isotopenanalysen es ermöglichen könnten überwinternde Tiere ihren alpinen Brutgebieten zuzuordnen. Bei zukünftigen Studien wäre insbesondere die kombinierte Analyse von Ringfunden und intrinsischen Markern ein wichtiger Schritt, um die Metapopulationsdynamik der Art besser zu verstehen und Hinweise für ihren Schutz zu liefern. We are indebted to all members of PARUS for invaluable support and assistance during winter and summer fieldwork in the EP and the CP. We are also grateful to Torreferrussa, and to all members of the Fundación para la Conservación del Quebrantahuesos and the Grupo Ibérico de Anillamiento-León for conducting the fieldwork and collecting the samples at CP and CM, respectively. We are particularly thankful to Susanne Tellenbach, Moritz Saxenhofer, Moritz Hilty and Miriam Zemanova for support in the lab. We are also indebted to Craig Hamilton, from the Academic English Services at Bern University, who kindly revised the English. This study was supported by the British Ornithologists’ Union, which awarded Jaime Resano-Mayor in 2014 with a Career Development Bursary. Birds were handled with the permissions of the Catalan Ringing Office and the Departament d’Agricultura, Ramaderia, Pesca, Alimentació i Medi Natural, Generalitat de Catalunya in the EP, the Picos de Europa National Park in the CM, the Departamento de Desarrollo Rural y Sostenibilidad (Gobierno de Aragón) in the CP, and the Swiss Office for the Environment. Ring recoveries were processed through the Catalan, Radolfzell (Germany) and Swiss Ringing Offices, and the Istituto Superiore per la Protezione e la Ricerca Ambientale (Italy). We thank two anonymous reviewers for valuable comments on the manuscript.